Scarlet morning glory, Ipomoea hederifolia, is an annual vine in the Convolvulaceae, or morning-glory, family. Ipomoea coccinea and Quamoclit coccinea are two synonyms for this particular plant. 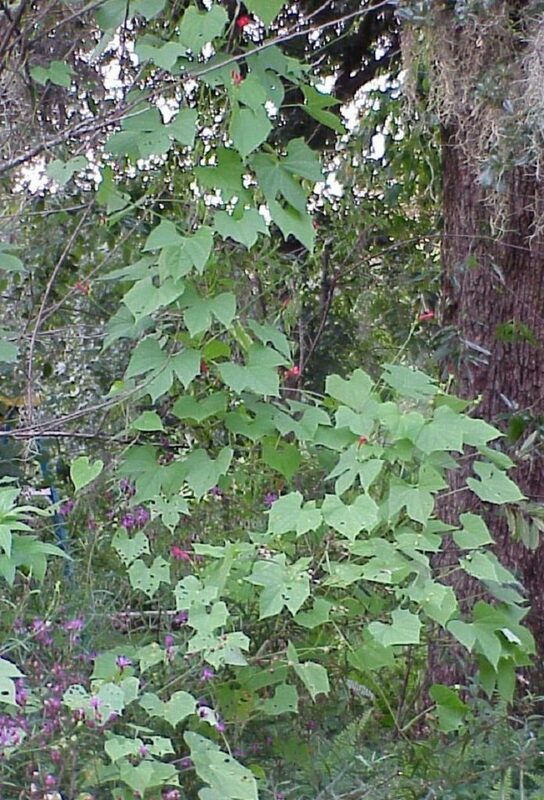 This annual vine typically climbs upward onto nearby vegetation by the use of tendrils. If allowed to grow near an existing tree or other support it will climb to well over twenty feet, however, if not supported it will grow along the ground forming a beautiful tangle of foliage and flowers. 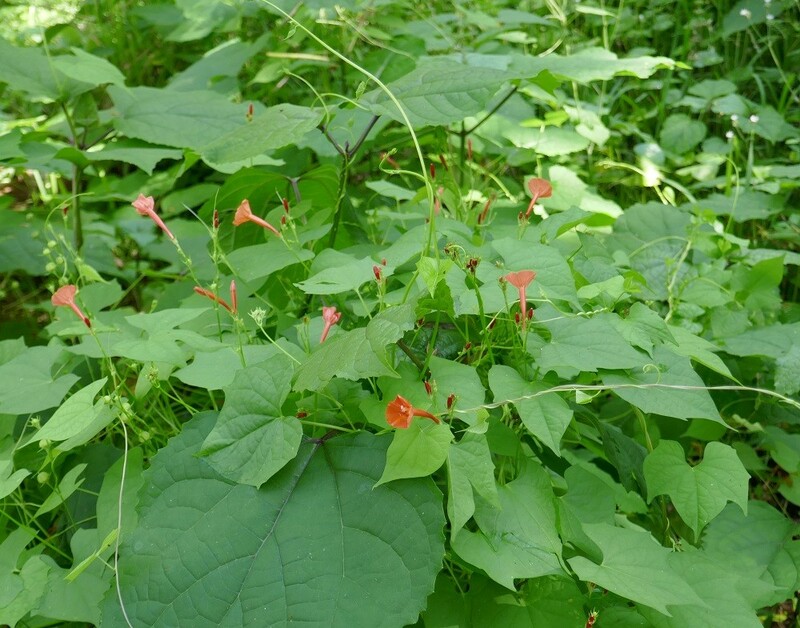 Scarlet morning glory occurs mostly in disturbed sites but can also be found in hammocks, thickets and fields throughout Florida, southern Georgia, west Texas and north to Massachusetts. It also occurs in Mexico and the West Indies. The leaf shape is variable, but most are heart-shaped with three deep lobes that are pointed at the tips (apices). Leaf sizes can vary from 1 to 4 inches in length. Some leaves may have toothed margins, while others may not. The leaves, stalks, and stems are generally smooth. 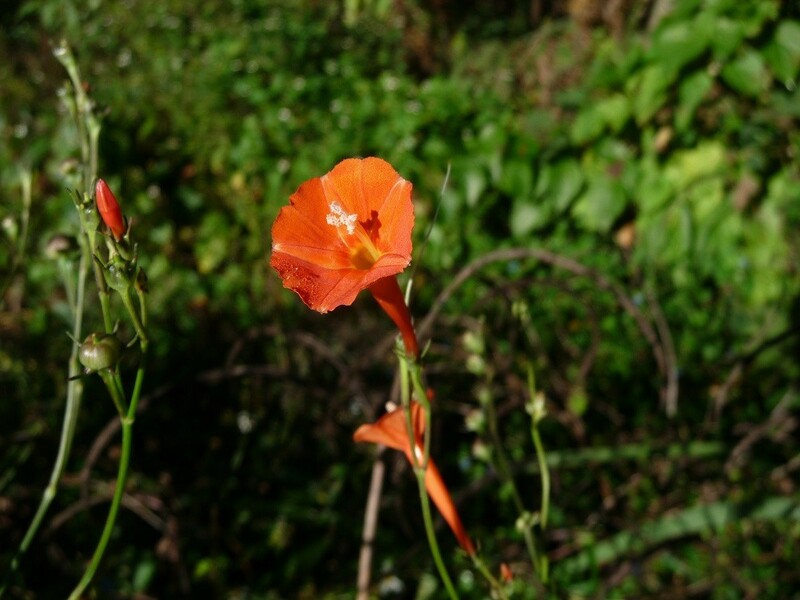 The brilliant scarlet flowers appear in the summer and fall and are 1 to 2 inches in length. They appear in small clusters with very long stalks or peduncles. The flower tube is long and narrow with the petals flaring out to form the bell of the trumpet. The stamens and pistil extend beyond the end of the flower. Although the flowers are very similar in size and appearance to those of the cypress vine (Ipomoea quamoclit) the foliage of cypress vine is feathery in appearance and quite distinctly different than that of scarlet morning glory. Quarter inch round seedpods appear throughout the summer and fall along with the flowers. They contain four cells with each cell containing a seed. They turn dark brown when dry enough to collect. The flowers are a nectar source for a variety of pollinators including hummingbirds and butterflies. Songbirds, especially cardinals, eat the seeds. Scarlet morning glory will re-seed in the home landscape and thrive where it was originally planted year after year without any human interference whatsoever. It prefers full sun, average moisture, and rich soil. It will tolerate shadier, drier, and sandier conditions, but will not flower as profusely and will show some yellowing of the leaves. Many gardeners consider the morning glory to be a weed, but I have found them to be one of the most carefree and attractive plants providing color in the landscape and food for wildlife, and therefore, is one of my favorites. Buy scarlet morning glory seeds at Sharon’s ebay store … click here.